Few cities combine culture and natural beauty as artfully as the city of Vancouver in British Columbia, Canada. A cosmopolitan city nestled against the snowcapped Coast Mountains on Canada’s west coast, Vancouver attracts around 8 million visitors each year. 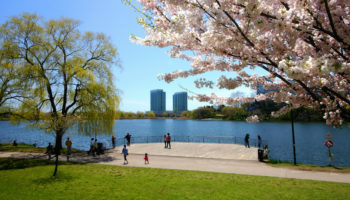 The city boasts an engaging assortment of world-class museums, theaters, art galleries and great seafood restaurants, but it’s the waterfront trails, urban beaches and scenic harbor that differentiate Vancouver from other metropolitan destinations. With so many opportunities for recreation within the city, visitors don’t have to leave Vancouver to enjoy outdoor activities, but the natural wonders that lie just outside the city’s boundaries are too good to miss. 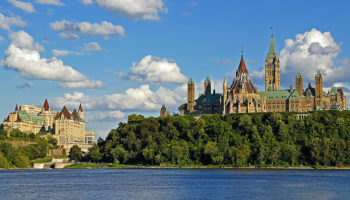 These day trips from Vancouver are sure to enrich any visit to Canada’s third-largest metropolitan region. Located east of Vancouver in the southern tip of Harrison Lake in Fraser Valley is the small village of Harrison Hot Springs, a resort area that has been enticing day-trippers for more than 100 years. Taking the waters is the main attraction in this lakeside city, and there are both indoor and outdoor mineral soaks in a range of warm and cozy temperatures to enjoy. Other activities include boating on the lake, golfing and hiking. 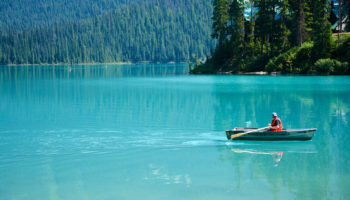 North of the city is the nearby Sasquatch Provincial Park where visitors can fish or canoe on one the park’s many pocket lakes. An hour’s drive north from Vancouver on the Sea-to-Sky Highway takes day-trippers to the city known as Canada’s outdoor recreation capital. Located at the northern tip of Howe Sound, the small town of Squamish offers easy access to some spectacular scenery and an exciting mix of outdoor adventures. With more than 300 climbing routes, the monolithic Stawamus Chief is a can’t-miss activity for rock climbers, and for sightseers, the view of the sky-high Shannon Falls crashing into the Howe Sound offers an unforgettable experience. New to Squamish is the Sea-to-Sky Gondola that whisks visitors to a lodge and restaurant located between the Chief and the Falls. Salmon fishing has played a significant role in the Vancouver region throughout its long history, and that tradition is still celebrated in the historic village of Steveston located at the mouth of the Fraser River. Now part of the city of Richmond, the community remains an active fishing port, boasting more than 600 boats, some of which operate whale watching excursions. Steveston’s waterfront boardwalk is a great spot to take in the scenery and enjoy the catch of the day. Often used as a filming location, Steveston attracts fans of television shows like “Once Upon a Time,” “The X-Files” and “Stargate SG-1” as well. The waters around Vancouver and Vancouver Island teem with wildlife, from sea lions and seals to eagles and herons. The Gulf of Georgia is also home to three pods of orcas with a combined number of around 100 killer whales. Minke, gray whales and humpbacks can also been spotted at various times of the year. Whale watching adventures around Vancouver range from leisurely three-hour cruises in comfortable covered boats to exhilarating rides in inflatable Zodiacs. Departure points include Victoria, Steveston and downtown Vancouver. Located just 15 minutes outside of Vancouver, Grouse Mountain is a popular year-round outdoor destination, with hiking in the summer and great skiing in the winter. Any season of the year, a tramway whisks visitors to the top of the mountain where they’ll see awe-inspiring views. The resort also boasts a wildlife refuge, complete with bears, wolves and interpretive programs. Equally enjoyable is a lumberjack show where visitors can watch lumberjacks competitively chop, saw and roll logs. And if you get tired of all that, there’s always the view of Vancouver laid out below. Located just a short ferry or water taxi ride to the northwest of Vancouver, Bowen Island is a popular destination for tourists and locals alike, particularly when the weather is warm and sunny. Relaxing at one of the island’s many sandy beaches is the favorite activity here, but the small forested island offers plenty of hiking and mountain biking opportunities as well. A challenging climb up to the top of Mount Garner rewards hikers with gorgeous views. Shops close to the ferry landing in Snug Cove feature art, jewelry and crafts made by local artisans. Some of the most popular excursions from Vancouver are day trips across the Strait of Georgia to Vancouver Island where the Butchart Gardens is a favorite destination. Portland cement magnate Robert Butchart operated a quarry here in the early 1900s, and when the quarry was exhausted, he and his wife Jennie turned the pit into a series of themed gardens. Remnants of the old quarry can still be viewed in the walls of the Sunken Garden. 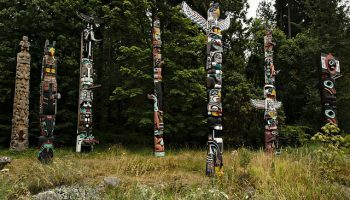 Vancouver’s mild climate means that there are flowers in bloom the year round, and the estate’s fountains, sculptures, totem poles and carousel are enjoyable in every season. Perched high in the Coast Mountains north of Vancouver is the popular resort town of Whistler, considered one of the world’s finest ski destinations. The resort can be reached by driving or a train ride along Canada’s most scenic route, the Sea-to-Sky Corridor. Around 2 million people visit Whistler each winter, but with more than 200 trails, the skiable terrain is so expansive that it rarely feels crowded. Thanks to the renovations that took place when Whistler hosted events for the 2010 Winter Olympics, the gondolas, lifts and chair systems that service Whistler and its neighboring mountain Blackcomb are world-class. 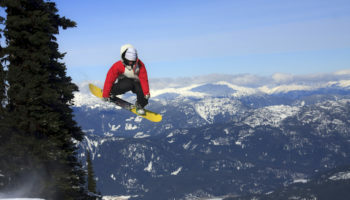 Skiing and snowboarding are enjoyed well into summer in Whistler, and the area is a popular place for highline hiking during the off season as well. 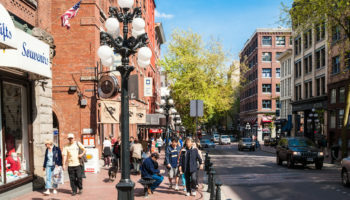 Located on the southern end of Vancouver Island, the capital city of British Columbia has enough sights and attractions to warrant several day trips from Vancouver. Most of the 4 million people who visit Victoria each year head for the Inner Harbour first. Ferry tours of the rocky-shored harbor offer picturesque views of the waterfront and the Old Town district beyond it. 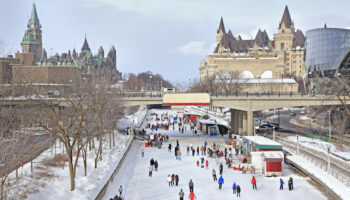 The historic city center boasts several buildings that date to the 1840s, including the Parliament Buildings and the Fairmont Empress Hotel. 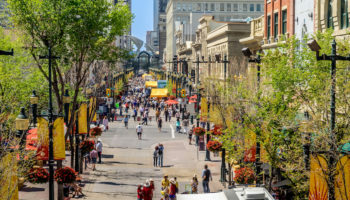 With more than 7 million objects ranging from First Nation artifacts to items related to the city’s gold rush days, the Royal British Columbia Museum is well worth an extended visit.